The first evidence of Hans Holbein working for the royal family is a design he made for triumphal arches for the processional route following the wedding of Henry VIII and Anne Boleyn in 1533. He also designed a cradle for Princess Elizabeth. In about 1536 Holbein painted a small portrait of Henry (source 1). It is the only universally accepted portrait of Henry by Holbein to survive. In 1537 Holbein produced a large wall painting for Whitehall Palace. This showed Henry, Jane Seymour, and his parents, Henry VII and Elizabeth of York. The painting was destroyed in a fire in 1698. A preparatory drawing of Henry for the wall painting has survived (source 5). 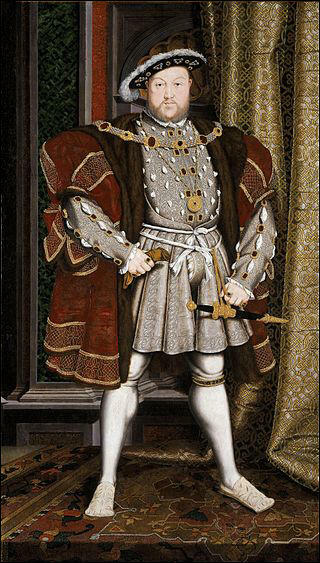 We also have several copies of Holbein's paintings of Henry VIII. For example, sources 7, 9 and 11. His (Henry) impressive physique soon began to show the evidence of his rich diet and reduced exercise. Whereas in 1536 the King's armourer had measured a 37-inch waist and a 45-inch chest, by 1540 he had to contend with a 54-inch waist and a a 57-inch chest. His square beard, earlier kept permanently short in a fashion that other courtiers were commanded to follow, now disguised his jowls. Meanwhile his cropped hair was going bald on top, hence the perennial feathered hat that he wore. This is the quintessential image of the overbearing and tyrannous monarch, from the year of the dissolution of the monasteries was instigated. Holbein depicts the King at 'face value', without flattery, emphasizing the small, humourless eyes and mouth, the curiously flatcheeks and chin. Henry's bulky and capriciously authority haunts the work despite its small size. Its condensation of magnificence run riot here takes the form of real gold used in the chain, jewellry and collar. Hans Holbein was a memorable icon-maker. He established the image of Henry VIII for all time. His standing portrait of the king has influenced every subsequent picture or impersonation. But it is his other, close-up portrait that has real iconic force. This small and portable head-and-shoulders likeness is no bigger than an A4 sheet. It was, perhaps, made to go abroad on a diplomatic mission. It's constructed not only as a portrait but as a substitute effigy. The monarch is identified with the rectangular panel of oak on which he's depicted. His image is fitted to its shape and flattened to its flatness. He is this painted object. Holbein's high-definition realism, his inexhaustibly accurate observation, are forced into a rigorously artificial design. The most outrageous trick is the way the whole right-hand edge of the king's face, from eye to chin, is made into a precisely straight, precisely vertical line. Likewise the top of his shoulders becomes a near horizontal line going right across the picture, making the king's torso beneath it into a sub-rectangle. And this vertical and horizontal intersect in a right angle, which defines the top-right rectangle of the pure ultramarine blue background. The edge of back of the head, behind the ear, also has a straight, upright, run, which meets the jutting-out back of the black hat in another right angle. And there's another horizontal in the straight top edge of the chest-piece. We're also encouraged to see him as a pattern, laid out on the surface of the wood. His body is an ornamental arrangement, made of distinct pieces of opulent fabric – linen, fur, embroidery, gold cloth. The entire figure, though not quite as flat as a traditional icon, doesn't feel much thicker than a quilt. The flesh of the face is subtly shaded without ever acquiring real volume. The torso swells a little, like a thin cushion. Likewise, the fur-trimmed hat is just a flat pattern. One of the most beautiful sensations of this picture is the way the king's forehead tucks into the hat's opening like folded paper being slipped into a tight envelope. Finally there is the tassel of fur that spills off the back of the hat in a rounded, spiralling comma. And with that, the king is locked into his image. He is here before us, present on its wooden surface. We can pick him up, hold him in our hands, look him in the eye, rock him like a baby. Holbein's image highlights the cautious, untrusting, suspicious side of Henry's character, or what contemporary diplomats and ambassadors described as his 'foxy' nature. 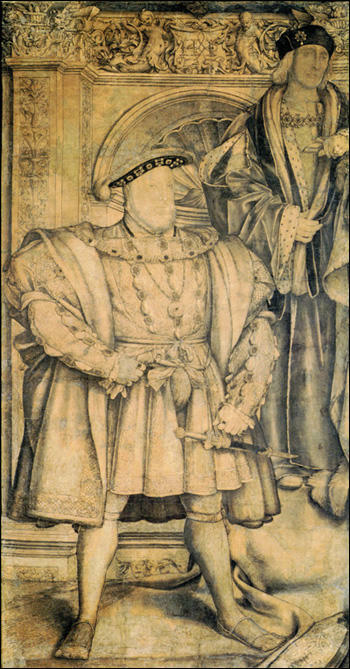 The somewhat unflattering likeness but politically useful image, enhancing his authority and assertiveness, must have pleased the King, for Holbein used it as the basis of his first draft of the full-length life-size portrait of Henry VIII for the Whitehall mural. In 1537 Holbein executed a large wall painting for the Privy Chamber in the palace of Whitehall, now destroyed. 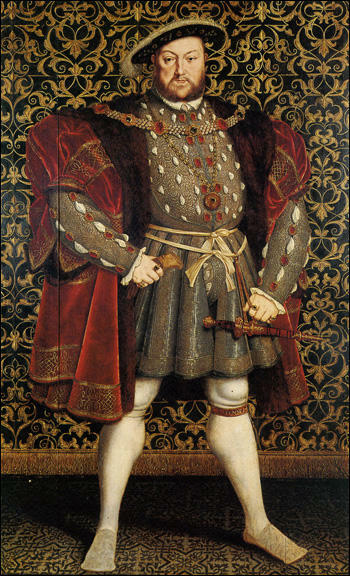 This showed Henry - with Jane Seymour, Henry VII and Elizabeth of York - as head of the Tudor dynasty; Henry himself was shown life-size in a dominating frontal stance with legs apart. It is not surprised to read in an early account that visitors were 'abashed, annihilated' in his presence. 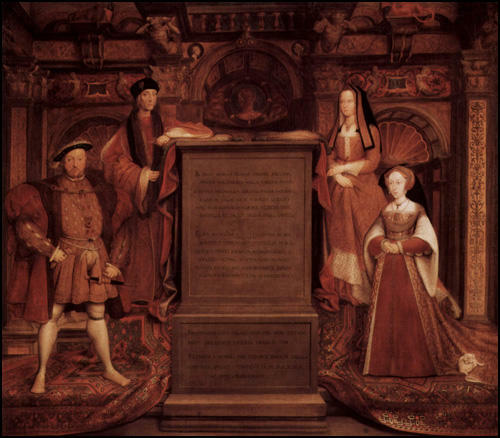 Holbein's great dynastic portrait of Henry VIII, his third wife, Jane Seymour, and his parents, Henry VII and Elizabeth of York, was painted on the wall of the Palace of Whitehall in 1537, probably in the privy chamber (destroyed in the fire of 1698). Its appearance can be reconstructed from the survival of the cartoon for the left half, showing the life-size figure of Henry with his father, and from the copy by Remigius van Leemput made for Charles II in 1667; the veracity of the Latin inscription celebrating the two heroes of the dynasty on a stone altar between the kings is confirmed by a record of it made by a foreign visitor to Whitehall in 1600. Between the cartoon - where the head is close to the image of the Thyssen portrait - and the finished portrait Holbein reorientated the face of the king so that it looks directly at the viewer, an imposing confrontation with the monarch which was to be reiterated in numerous painted copies of the full-length image. The small copy of the Whitehall mural, painted on canvas in 1667 by the Flemish artist Remigius van Leemput (an assistant of Van Dyck) is now the only complete record available of the great wall-painting (roughly 9 feet high by 12 feet wide; 270 x 360 cm) at Whitehall Palace, which was burned down on 4-5 January 1698 in a fire started when a laundry maid left washing drying in front of an open fire. The Walker portrait is one of a number of versions of broadly the same pattern following Holbein's portrayal of Henry VIII in a mural in the Palace of Whitehall in 1537. The mural is now lost but it recorded in a copy by Remigius van Leemput of 1667, and a full-sized cartoon by Holbein of Henry VIII and Henry VII at the left of the composition survives at the National Portrait Gallery. Question 1: Read source 2 and explain why source 1 is so important to historians? What information is provided in source 2 to suggest that 1536 marked a change in the looks of Henry VIII? Question 2: In source 2 the author gives precise details about Henry's waist and chest sizes. Where do you think this information comes from? 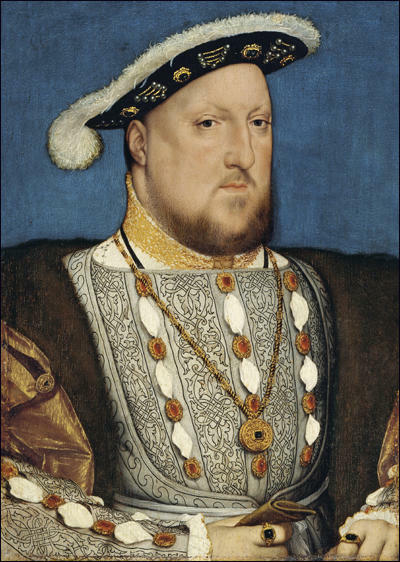 Question 3: Select passages from source 3 where the author suggests that Holbein did not flatter Henry VIII. Do you agree with this assessment. If so, why did Henry not destroy the portrait? You might find it helpful to read source 6 before answering this question. Question 4: Read source 4. How does Tom Lubbock support his view that the painting has "a rigorously artificial design"? Question 5: Read sources 8 and 9 and then explain why source 5 is so important to historians. Question 6: Select sources from this unit that suggests that Holbein changed his mind about Henry's image that was to appear on the wall of Whitehall Palace. Question 7: Why are experts so convinced that source 7 was not painted by Hans Holbein?